Seattle – April 20, 2010 – DocuSign®, the leader in on-demand electronic signature solution , today announced a strategic partnership with iPipelineTM, the premier provider of on-demand sales distribution software for the insurance and financial services markets. Under the agreement, iPipeline will incorporate DocuSign eSignature technology into its e-Policy Solution. The project is set to launch in beta version on July 1, 2010 and more than a dozen insurance carriers are contracted to begin using this innovative iPipeline e-Policy Solution. "iPipeline streamlined the policy delivery process to eliminate errors and automate sales distribution. DocuSign provides a fast, safe and secure e-signing tool to complete the final stretch of the e-Policy process," said Timothy Wallace, CEO of iPipeline. "Adding DocuSign to our interactive e-Policy Solution offers carriers, distributors and producers a rich, easy-to-use tool that will simplify the workflow process and allow the consumer to easily sign electronically. We view DocuSign eSignature technology as a vehicle for increasing success in a highly-competitive environment and look forward to working with the DocuSign team." By using iPipeline's Network and e-Policy solution with DocuSign, carriers, distributors and producers can streamline the final leg of the insurance policy sales cycle with a cost-efficient, fast and secure online eSignature process. Twenty-five insurance carriers have already deployed iPipeline's iGO e-AppTM, an intelligent fillable forms solution that safely and securely manages the online insurance application process. Once iGO e-App is 100 percent in "good order," the carrier begins the underwriting process and issues an e-Policy for signature. Via iPipeline's Network, carriers can easily access DocuSign’s eSignature service, drag and drop familiar yellow Sign Here tabs and data fields within the policy, and send it electronically. 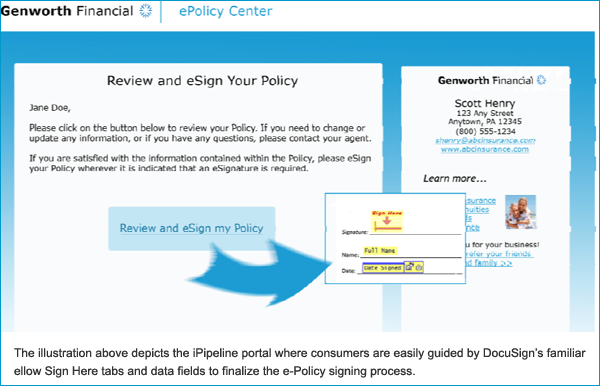 An email notification is sent through the agent to the consumer announcing that the e-Policy is ready for e-Signature. The consumer is authenticated, adopts an eSignature, e-signs and completes the policy. Once completed, the new policyholder, agent and carrier receive an email notification with a link to the signed executed policy. "In this economic environment, employing next-generation technology is the most cost-effective method to grow a business. This partnership leverages the best technology— iPipeline's Network and DocuSign's electronic signature service—to fulfill policies faster, safer and more efficiently," said Steve King, president and CEO of DocuSign. "We look forward to working with iPipeline to further streamline business processes, reduce costs and ensure the continued success of its customers." iPipeline leads its industry in providing the next-generation suite of sales distribution software as a "clean technology" to the insurance and financial services markets through its on-demand service. iPipeline's channel solutions for carriers, distributors and producers automate activities for quoting, forms processing, illustrations development, agency management, requirements ordering, contracting and content distribution, enabling the insurance industry to market, sell and process faster. iPipeline provides the process automation and seamless integration needed to make a sale by aggregating over 160 carriers, 1,200 distributors, and their financial professionals in a single, Web-based environment — the iPipeline Network. With headquarters in Exton, Pennsylvania, iPipeline has offices in Atlanta, Charlotte, Milwaukee, and Salt Lake City. Visit us at www.ipipeline.com.